Dale Carnegie said, "There are four ways, and only four ways, in which we have contact with the world. We are evaluated and classified by these four contacts: what we do, how we look, what we say, and how we say it." 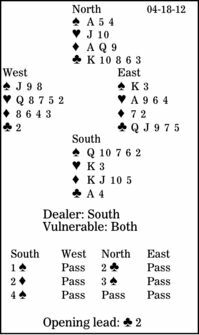 There are four tricks, and only four tricks, that are needed to defeat a contract of four spades. East needs to bear that in mind when defending in this deal. West leads the club two. South wins with his ace, plays a spade to dummy's ace, and returns a spade. East is in with his king. What should he do now? East knows that West led a singleton, because he would have led the four from doubleton four-two. And when a player knows his partner has a void, there is an automatic reaction to give him a ruff. But East should pause for a moment and ask where the other two defensive tricks will come from. The play cannot go club ruff, heart to the ace, second club ruff, because West has only one trump left. The defense must take two heart tricks. This is easy if West has the king, but in case he has the queen, East should immediately shift to a low heart. Yes, declarer might rise with his king and win an overtrick, but that is unlikely. He will probably conclude that if West had queen-high hearts, he might well have led the unbid suit; but with ace-high hearts, he would not have led it. The main point, though, is that East must make declarer guess, not give him the contract on a silver platter.